In this video we will discuss how to insert data into a table that has many-to-many relationship. As you can see, StudentCourses is a bridge table that has many to many relationship with Students and Courses tables. This means a given student can be enrolled into many courses and a given course can have many students enrolled. Below is the question asked in an interview for SQL Server Developer role. Write a SQL script to insert data into StudentCourses table. Here are the rules that your script should follow. 2. If the student is already in the Students table, then use that existing Student Id. If the student is not already in the Students table, then a row for that student must be inserted into the Students table, and use that new student id. 3. Along the same lines, if the course is already in the Courses table, then use that existing Course Id. 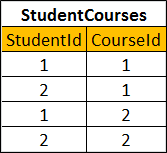 If the course is not already in the Courses table, then a row for that course must be inserted into the Courses table, and use that new course id. 4. There should be no duplicate student course enrolments, i.e a given student must not be enrolled in the same course twice. For example, Tom must not be enrolled in C# course twice. Answer : To avoid duplicate student course enrolments create a composite primary key on StudentId and CourseId columns in StudentCourses table. With this composite primary key in place, if someone tries to enroll the same student in the same course again we get violation of primary key constraint error. If required, we can very easily convert this into a stored procedure as shown below. What should I do if I have more variables to insert in both tables?